Robinson Cano is coming back to New York. Just not with the Yankees. Give new Mets general manager — and Cano’s former agent — Brodie Van Wagenen credit. This is the most creative move the Mets have made in a long time. Given the way the money works — including Bruce and Swarzak means this trade is close to payroll neutral in 2019 and 2020 — the Mets took on salary down the line with Cano to score four years of a top notch closer. This trade makes the Mets significant better on the infield and in the bullpen, and they gave up nothing they’ll miss off their big league roster. The question now is will the Mets continue to add? This alone isn’t enough to get them into the postseason. The Mets went 77-85 this past season but have a strong rotation and the makings of a good lineup. They still need help behind the plate and in center field, in the bullpen, and with overall depth. As for the Mariners, this trade continues their offseason fire sale, which has already seen Mike Zunino go to the Rays and James Paxton come to the Yankees. Using a player as valuable as Diaz to shed as much of Cano’s contract as possible takes a special kind of cheap, but it is what it is. Kelenic (sixth overall pick in 2018) and Dunn (19th overall pick in 2016) are two very good prospects, so it’s not like Seattle gave Diaz away. Bautista is an MLB ready reliever too. The trade has some indirect impact on the Yankees. 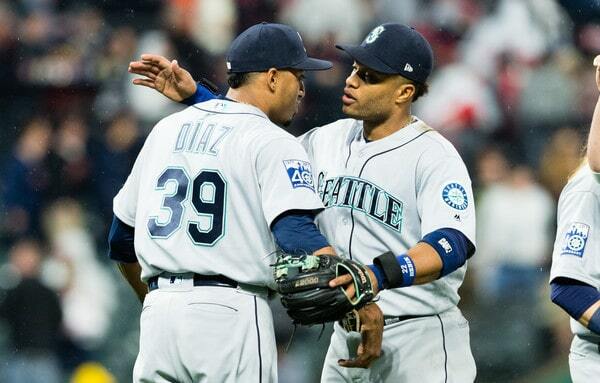 They’ve been connected to both Cano and Diaz this offseason, though a trade for either never seemed all that likely to me. The Yankees and Mariners talked Cano for Jacoby Ellsbury but the money was still an obstacle. Diaz would’ve been a great pickup. It’s just hard for me to see how the Yankees win a prospect bidding war for him if guys like Kelenic and Dunn were on the table. Also, with the Mariners going into tank mode, it means one fewer team to compete against next year should the Yankees have to settle for a wildcard spot yet again. I count six (!) rebuilding teams in the American League: Mariners, Orioles, Rangers, Royals, Tigers, and White Sox. More than one-third of the league is rebuilding. Geez. The Blue Jays and Twins aren’t looking so hot either. The AL is very top and bottom heavy right now. The rumors are starting to come in steadily now, and, in fact, player visits are going down. Patrick Corbin visited the Phillies earlier this week — they had the obligatory scoreboard photoshop ready to go — and tomorrow he’ll be in New York to visit the Yankees, according to Joel Sherman. For what it’s worth, Andy Martino hears Corbin is not expected to drag out his free agency. He could sign sooner rather than later. We’ll see. Here are the latest hot stove rumors. 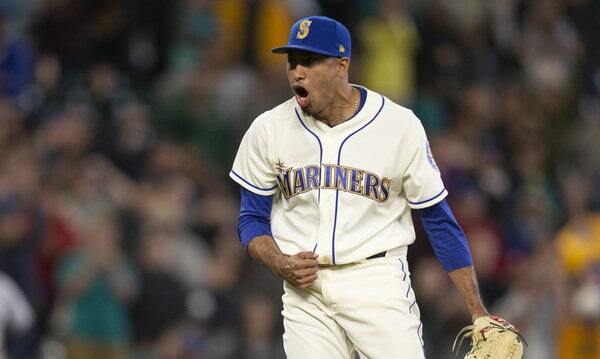 The Yankees were among the teams showing the strongest interest in Mariners closer Edwin Diaz, reports Joel Sherman. The Braves, Mets, Phillies, and Red Sox were also involved, though Sherman says everyone thus far has balked at taking on Robinson Cano to get Diaz. Presumably the more money you take on in Cano — he’s owed $120M the next five years — the less you have to give up in prospects to get Diaz. “What are those teams willing to part with in dollars to (get Diaz)?” a source said to Sherman. Diaz, 25 in March, has four years of team control remaining and he is electric. This season he posted a 1.96 ERA (1.61 FIP) with 44.3% strikeouts and 6.1% walks in 73.1 innings. He is on the short list of the best relievers in the game. The Yankees are said to want two relievers and Diaz would certainly be an upgrade to the bullpen. With Justus Sheffield gone, I’m not sure the Yankees have the prospects to win a Diaz bidding war, not unless they put Miguel Andujar or Gleyber Torres on the table. Taking on Cano’s deal might be their only way to get Diaz. Another Yankees-Mariners nugget. Been a lot of them these last few weeks. Anyway, according to Ken Rosenthal (subs. req’d), the Mariners wanted Sonny Gray in addition to Sheffield in the James Paxton trade. The Yankees balked because enough other teams are showing interest in Gray that they believe they can maximize their return by trading him and Sheffield separately. Obviously the two sides got the Paxton deal done without Sonny. The Athletics, Reds, Braves, Padres, Rangers, and Twins have all shown interest in Gray this offseason. We can now add the Mariners to that list. Wouldn’t it be something if the Yankees could build an Edwin Diaz trade package — or even a Jean Segura trade package — around Gray and, say, Estevan Florial? Plus a secondary piece or two? I expect the Yankees to get a decent return for Gray. Using him to get a true impact guy like Diaz (or Segura!) would be an A+ move in my book. According to Jon Morosi, the Giants are willing to discuss trade scenarios involving lefty Madison Bumgarner. The Yankees were not mentioned as a suitor — the Braves and Phillies are said to have touched base with San Francisco — but I’m certain they’ll show interest. They want another starting pitcher, and remember, the Yankees were “in the hunt” for Bumgarner at the trade deadline. I am a tad skeptical the Giants would actually trade a franchise icon, but it would make sense given their current situation and the fact he’s a year away from free agency. 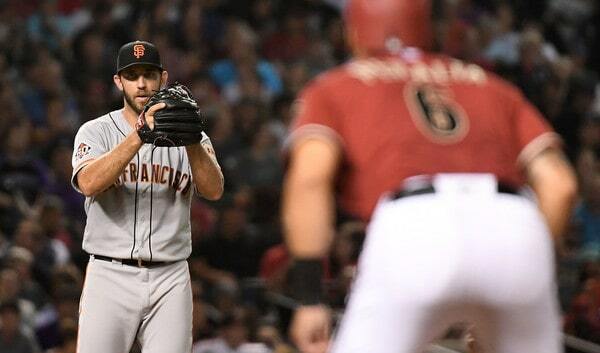 Jeff Sullivan wrote a post this week detailing Bumgarner’s decline. 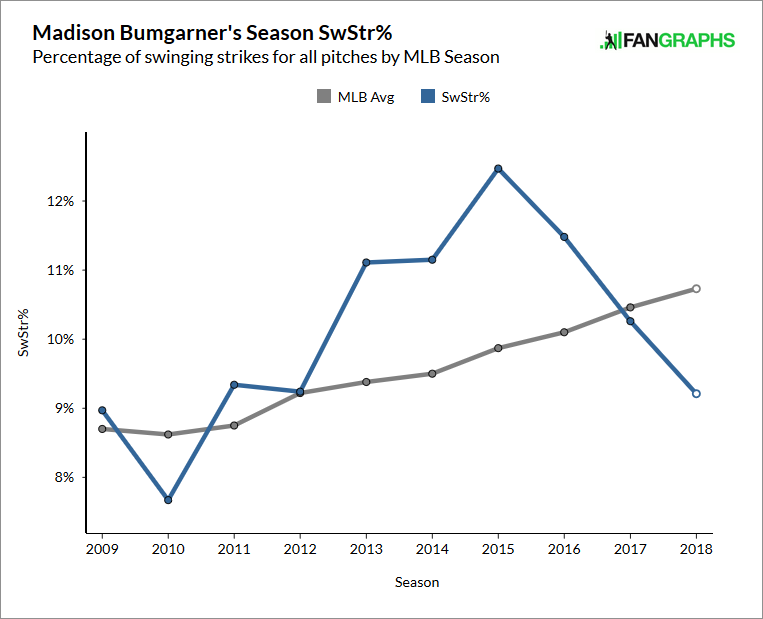 He’s still quite good — Bumgarner did have a 3.26 ERA (3.99 FIP) in 129.2 innings around a fluke finger injury (hit by a comebacker) this past season — but his velocity, swing-and-miss rate, and walk rate are trending down big time. I mean, look at this. Yikes. Bumgarner is still only 29, but he has a lot of innings on his arm, and he might be entering his Felix Hernandez decline phase. That said, there’s only one year and $12M on his contract, and the Yankees wouldn’t need him to be their ace or even their No. 2 starter. Depending on the asking price, rolling the dice on one year of Bumgarner could make an awful lot of sense. Mets righty Noah Syndergaard is available but the Yankees are not among the teams showing interest, reports Martino. Maybe the front office change in Flushing makes it possible, but a Yankees-Mets trade of this caliber? I can’t see it. For the Mets, trading Syndergaard to the Yankees would be an ownership decision, not a front office decision, and I can’t see the Wilpons signing off on that. Hypothetically, I think Syndergaard is one of the few pitchers the Yankees would be willing to trade Andujar or Torres to acquire. Syndergaard has had some injury problems the last two years, but he has no-doubt ace upside, and those guys are extremely rare. Three years of control with that potential? Hard to pass that up, even if you have to give up an Andujar or Torres. You’ve gotta give something to get something, after all. Like I said though, I can’t see a Yankees-Mets trade of this caliber going down. Yet another contradictory Paul Goldschmidt rumor. Rosenthal (subs. req’d) reports the Yankees are not pursuing the Diamondbacks’ first baseman at this time. They prefer a lefty bat and don’t see first base as a top priority right now. A few weeks ago we heard the Yankees didn’t have interest in Goldschmidt, then, earlier this week, it was reported they pushed Sheffield in trade talks with Arizona. That was a secondhand report though. I’m inclined to believe the “they’re not really pursuing him” rumors. It’s more interesting to me that the Yankees, at least according to Rosenthal, do not consider first base a top priority at the moment. Greg Bird stunk last year, and while Luke Voit was awesome, his track record is basically one month, and that month is September, when weird things happen. There are always cheap first base stopgap types available in the days leading up to Spring Training — what are the odds Lucas Duda signs before February? — so if the Yankees want some first base depth, they’ll be able to find it. Guys like Goldschmidt don’t become available often though.